Happy New Year! I hope you had a fun holiday season and took some time off to relax and spend time with your family and friends. We took a trip to India to visit my family and wrap a few final photoshoots for my cookbook. Bombay and Goa were amazing, I finally got to meet up with Nigella Lawson and we all got dinner together at a Gujarati thali spot in South Bombay. I also encountered my very first snake in the wild in India, believe it or not I've never seen one in all the years I lived there barring a zoo. India was amazing and as always too short of a trip. 2018 promises to be an exciting year for me, my first solo cookbook Season, will be out sometime this Fall and to be honest, I'm ecstatic and a little anxious. I've been working closely with the highly talented and amazing editorial team at Chronicle Books, looking at design layouts, galleys, fonts, text edits and many other things that I never considered that might go into creating a book. Over the next few months, I'm going to share my experiences working on the book and what I learned from start to finish. Some of you might be future cookbook writers while some might be interested in the entire process, if you have any questions leave a comment below so I can address them in future book related posts. So let's start right at the beginning, to around three years ago. My blog had been active for a couple of years and the idea of writing a cookbook had crossed my mind but to be honest, I had no idea what it entailed or how to go about it. From what I read online and the authors I spoke to, finding an agent was a good starting point. But how does one find an agent or do they find you? How do you know if an agent is the right fit or not? What does an agent really do? There were so many questions and fewer answers accompanying them. Most authors I had spoken with said agents had found them, this in itself seemed rather extraordinary. I went to Google and did some research and reached out to an agent I came across in an online interview asking her to take a look at my work. She came back with an answer that I really didn't want to hear "At this point, I don't think your work warrants a book. Good luck!". It felt pretty gut wrenching, not because she didn't think I couldn't write a book but the fact that my work was somehow lowered in value by her comment. There were no explanations and I didn't know what I could do to make my work more "valuable" in her eyes. So I dropped the idea of writing a book and focussed on the blog. But back then I didn't realize how significant this experience would end up being for me. Over the next few years, I sought out to learn more about cooking and new professional opportunities poured in. I started to write my food column for the San Francisco Chronicle and wrote for other print media publications. I was busy and having fun. Then around 2 1/2 years ago, I got an email from an agent named Maria Ribas at Stonesong Literary Agency, she wanted to talk and gauge my interest in writing a book. Based on my previous experience, I had no high expectations and still wasn't sure if a book might happen in my lifetime. But thankfully, I got on a call with Maria and it changed my life for the better! Maria has an infectious personality and I could feel her energy right through the phone, there was a strong positive vibe and we instantly connected. Maria had a game plan but more than anything, I sensed that she genuinely had my best interests at heart and she believed in my work and saw real potential. As a new writer still finding his way around, I needed a little guidance and Maria steered me in the right direction. We signed a contract and started to work together. Over the next few months, Maria helped me shape my book proposal, we worked on it hard. Once she felt good about it, she decided it was time to shop it around. She had a timeline cranked out and got on the phone and kicked things in motion. I didn't hear anything for about two weeks and then suddenly one day, Maria said she had gotten a call from an editor who wanted to talk on the phone. Little did I know, that once the proposal goes out, editors who are interested will want to talk to you on the phone and get to know you better. As Maria said you are also interviewing them as much as they are you. Over the next few weeks we went from talking with one to more than 15 editors at different publishing houses and imprints who were interested in the book proposal. It was exciting but it also taught me the value of a good agent who really connects with you and believes in you. Some editors had lots of questions, some wanted to talk about the book while others about my life and hobbies. But there was one publishing house and editor that stood out early on, the editor didn't have too many questions on the phone for me and said she cooked from the proposal and said her daughter loved my roast chicken recipe. This was a first for me and not something a lot of the other editors had mentioned in their calls. It felt personal. At some point after about 2 months of phone interviews, Maria set a date for offers to be received and finalized. Publishers who were interested would make an offer and we would then sit, talk over the best options for me and go with one that seemed like the right fit. Maria also told me that the best deal doesn't necessarily translate to the highest monetary bid but to also keep in mind what the publisher is offering you in terms of marketing and how much you will get to be involved etc. For a first time book author, you want it to make it a choice that is beneficial to your career. The offers came in and we went into auction! If a book goes into auction then you need to wait a little longer till the competing publishers finalize their best bids. We went with Chronicle Books, the same publishing house where the editor had started to cook from some of the recipes in the proposal! Right from the start, Chronicle Books offered the option for me to be intricately involved in the book design and since the book was going to be highly visual with a specific POV. They were local which was also wonderful because I could drop by when needed and see things happen in their work space. 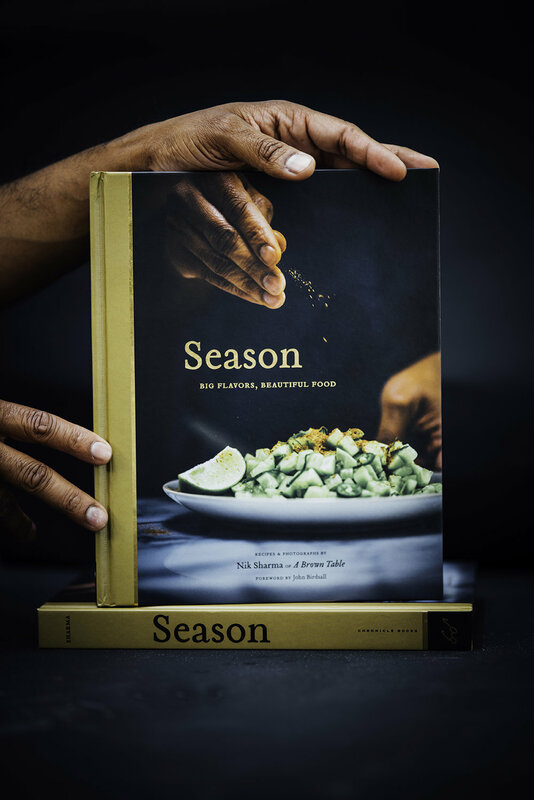 We signed a contract and chalked out delivery and release dates and over the next two years, I worked on "SEASON" cooking, writing and photographing. Looking back now, I think the first agent that rejected me did the best thing for me. I ended up focussing more on my work and also figuring out what I wanted to write about in food and develop a specific POV in cooking. Rejection is common in food media and doors will close more than they open on you, that experience helped me mature as a writer. So keep your head up high and focus on your work, realize your potential, kick the negativity out and making yourself the best you can be. Here are some things I've learned and this might not apply to everyone, there are authors who are comfortable navigating the book deal process alone but I prefer the agent route since it very similar to buying a house which is challenging. don't get discouraged, if you really want to write a book, believe in yourself and go with an agent that feels the same way. They need to have your back at every stage from the start to finish and beyond. above all a good relationship with your agent is priceless.